This week's challenge at The Card Concept (#56) gave us this sweet image as our inspiration. I gave up coffee several years ago and drink hot tea in the mornings. 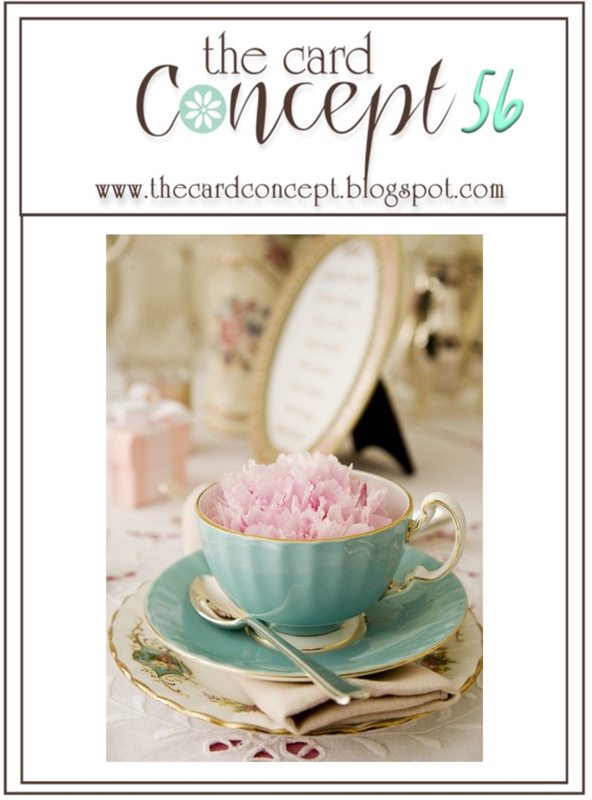 I love pretty little cups and I've used tea cup images before as my inspiration. In fact, another challenge that I participate in, Inspired by All The Little Things (#17) also has a tea cup for inspiration this week. It's always nice when I can combine one card for 2 challenges. I wanted to include some of the elements into both images; the teacup first and foremost. I happen to have this little tea cup die from Papertrey Ink called "Fancy Teacup" so that was where I started. The first image feels totally vintage inspired so I channeled my inner Melissa Phillips and that was the look I chose for my card today. Melissa usually combines Shabby Chic with Vintage. I don't know that I was particularly effective at getting the look of both, but I gave it my best shot. I started by die cutting all the elements I wanted to use - the Fancy Cup (cut from a scrap of Audrey Blue), a metallic gold oval frame, Bookmark #3 (also from Papertrey Ink), and lots of little hearts using the Mini Hearts Set Craft Die from Simon Says Stamp for the "Cup Full of Love". I used the soft teal color from the first image for my cup. It is a two part die so I used metallic gold cardstock for the bottom solid layer and also inked up the edges of the assembled cup with a Gold Cat's Eye Pigment Ink Pad. I could have used my bigger ink pad but the smaller one made it easier to get into the small places and also control where I actually put the ink. I wanted to use an oval frame like in the first inspiration image so I cut a Spellbinders Oval Floral Frame in the middle size from Metallic Gold Cardstock. 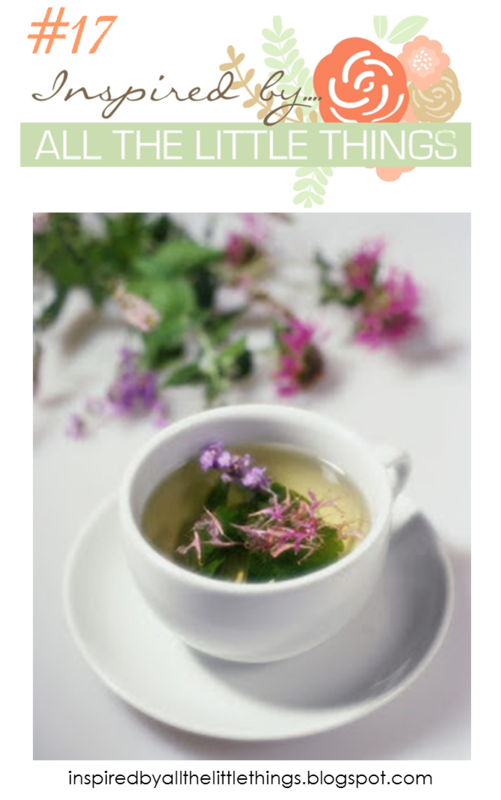 I could have left the bookmark off, but I felt like it also helped to ground the image of the tea cup. I used Rustic White Cardstock rather than the stark white of Stamper's Select White Cardstock for the bookmark, the banner and the card base because I felt it was more in line for the feel of the card. Using my Audrey Blue Ink from Simon Says Stamp with a Ranger Mini Ink Blending Tool, I softly blended the ink around the outside area onto the bookmark, the banner and the card front then inked up the edges of those things with the Gold Cat's Eye. The blue behind the frame is Surf Blue Cardstock from Simon Says Stamp and the "You" (stamped in Tropical Teal Ink) is from the Scripted Stamp Set from Papertrey Ink as is the sentiment on the banner. To continue to tie in the gold, I stamped the sentiment line in Versamark and heat set it with Simon Says Stamp Antique Gold Embossing Powder. Finally I began to assemble my card using a variety of mediums - Multi Medium Matte, ATG, and Foam Squares. The overall color tone of this card is very soft in much the same way that Melissa achieves on her Shabby Chic cards and projects. I'll also be entering this in the Simon Says Stamp Wednesday Challenge "Anything Goes". I hope you enjoyed this card and that you are having a great Memorial Day Weekend. Thank you so much for stopping by today. It means a lot to me when you take time to comment, so please feel free to do so. Pretty card! Fun take on both challenges! Oh, this is so pretty! Wonderful take on the inspiration photo! Such a pretty tea cup and card Vicki! Thank you for sharing with us at Inspired By All the Little Things this week! Gorgeous card Vicki! The gold card looks so elegant and the little hearts are so cute. Super card design! Thanks for joining us at Inspired by all the little things! Very pretty card, Vicki! I love that pretty touch of gold! Thanks for joining us over at The Card Concept this week! LOVE the sentiment your put together with the teacup and gold frame! Thank you for playing at Inspired By All the Little Things this week!